Four of the six Founders are buried in the Midwest (western Pennsylvania, Ohio, and Indiana); three of them are within forty miles of Canonsburg. One Founder is buried in California, and another in Louisiana. Each headstone was marked by the Fraternity early in the twentieth century to indicate the deceased as a Founder. In the case of both Crofts and McCarty, Phi Gamma Delta erected a memorial stone in the absence of any other. 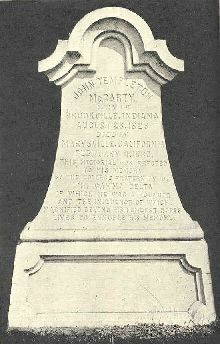 McCarty died on February 4, 1860, and was buried in the pioneer cemetery in Marysville. The grave was unmarked until William F. Chamberlin (Denison 1893) arranged for a stone to be placed here. In 1938 the Fraternity moved McCarty's remains to another nearby cemetery. Hence, the directions provided in The History of Phi Gamma Delta, Tomos Alpha are incorrect. Directions: On State Route 70 five miles south of Marysville, take the McGowan parkway exit. Turn east at the stop sign; proceed to Olive Avenue, turn left, and continue north to the gates of Sierra View Memorial Park. McCarty's gravesite is located at the extreme back part of the cemetery on the left side of the mausoleum towards the equipment garage, under a large tree. Lot C, Section 40, Block 6. Wilson died on January 17, 1889 at sixty-five. He and his wife Elizabeth are buried in Beaver Cemetery. His stone is among the most notable in the cemetery and easy to spot. Also in Beaver is Wilson's old home and law office, in which his son and grandson also practiced. At the time of his grandson's death it was Pennsylvania's oldest law office in continuous use. It remains in private hands and is not open to the public. Directions: Beaver, Pennsylvania is about forty-two miles north of Canonsburg. As you exit Pa. 60, follow Pa. 68 into Beaver; you will soon pass Beaver Cemetery on the left; drive through the cemetery to the chapel in the center. Brother Wilson's imposing monument in on the left side of this building. Elliot died at fifty-nine years on November 10, 1883 in Chicago, where he had moved to be with his son Frank. Later his remains were moved to Springhill Cemetery in Wellsville, Ohio. He is buried next to his wife Rachel. The metal star in front of the stone is a Grand Army of the Republic marker, indicating his army service in the Civil War. Directions: Wellsville is about twenty-eight miles from Wilson's grave in Beaver. Take the first Wellsville exit off Ohio 7; follow this street (Lisbon) into town until it intersects with Broadway; turn right and drive out of town going under Ohio 7; the street then becomes Springfield Road; follow this to the top of the bluff where you will find the Springhill Cemetery entrance on the right. As you drive in, turn right into Section 10; then turn right into Section 15; then turn right into Section M; as that roadway curves left at Section I, stop the car; Brother Elliot's gravesite is on your left. Ellis Gregg died on December 18, 1854 after a long illness and an unsuccessful operation. He was twenty-seven. Initially buried in his mother's garden, after her death, Gregg's body was moved to Laurel Point Cemetery in Carmichaels, Pennsylvania, next to his parents. Directions: Carmichaels is some fifty miles south of Canonsburg. Drive north on U.S. 119 out of Morgantown; turn left on Pa. 88 at Point Marion; proceed about 12 miles to Carmichaels; turn right on George Street and proceed to the town circle where you will turn left on Market. Follow Market north, passing historical Greene Academy on the right; turn right on the next road just before an iron bridge; as you enter Laurel Point Cemetery, take the left fork and park at the end of the gravel. Gregg's grave is directly in front of you a few sites as you walk in the old section of the cemetery. Crofts headed south in 1851 to seek relief from his advanced tuberculosis, and probably picked Clinton because of its reputation as a legal center. He died in January, 1852 in a hotel there in Clinton; he was buried in part of the hotel owner's cemetery plot. Burial expenses were defrayed by public sale of his meager belongings, including his gold fraternity badge. The grave was marked only by a few bricks until the Fraternity placed a stone there shortly after 1900. Directions: Clinton is at the intersection of Route 10 and Route 67, about 100 miles northwest of New Orleans, or about 30 miles north of Baton Rouge. Traveling west on Highway 10 (St. Helena Street), the 1840 courthouse is on your right. Stop by the clerk's office for a postcard and townmap; you can also get copies at the sheriff's office just a couple of blocks south of the courthouse. Note the famous "lawyers' row" along the north side of the courthouse. At the square, turn left onto Bank Street. Just past the historic Marston House, turn right onto Marston Street. Clinton Confederate Cemetery is ahead to the left. Fletcher was editor of the Wabash Gazette and Intelligencer until stricken with typhoid fever in November, 1864. "He lay ill for thirty-two days. [Tomos Alpha erroneously reports the illness as of only three days' duration.] He died on Tuesday, December 20, and was buried the next day." The stone pictured here was duplicated and replaced in 1992 by the Fraternity. Directions: Wabash, Indiana is located northeast of Indianapolis and can be reached via U.S. Route 24. Follow Business 24 into Wabash where it becomes Stitt Street. Turn left onto Falls Avenue, which will take you to Falls Cemetery. Turn right into the main entrance of the cemetery and follow the driveway turning right at the first opportunity. As you go up the small rise, there is a large oak tree followed by a large spruce on the right side. Fletcher's unique tombstone is next and is easy to spot as it is right beside the road.